Happy Monday!! As y'all know, I love to cook! And there are times when it seems like I get out every pot and pan I own to make dinner, so I dread the clean up! Well, this is the dish you make when you don't want to pull out every kitchen appliance you own or when you have so much going on you don't have time to dirty the kitchen. It is simple, easy, healthy!, and only requires one dish!! You heard me, just one! If you follow the blog, you also know I'm partial to Mexican style food-- which is typically loaded with salt and fat when you go out to a restaurant :/. So, I love exploring new recipes at home that will satisfy my Mexican taste buds and the RD in me. This dish does the trick!!! 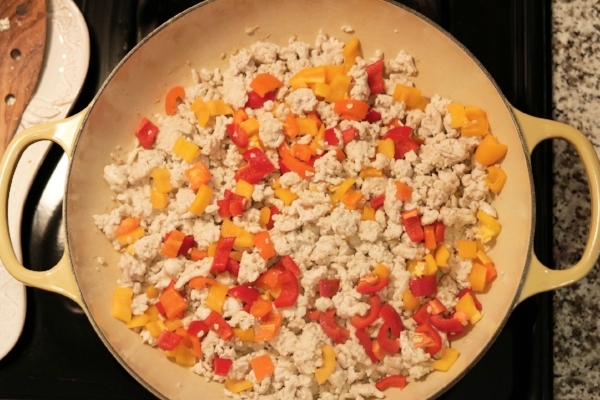 Inspired by roaming Pinterest and adding a few personal touches, this turkey quinoa taco skillet is one you are going to want to try! Using your choice of oil or spray, coat a large skillet and heat over medium-high heat. When the skillet is hot add minced garlic and cook for about a minute. Add in the ground turkey cook until the meat is almost cooked through, breaking it up into crumbles with a spoon as it cooks. When meat is about half way cooked, add in bell peppers. Stir in all the spices and the diced green chiles, cooking for another minute. 5. Add in the black beans, corn, fire roasted tomatoes, salsa and quinoa, stirring until everything is combined. 6. When the mixture starts to bubble add in the water, cover the skillet with a lid and lower the heat to medium-low. Simmer for about 20-25 minutes or until the quinoa is cooked. I didn't drain my tomatoes and ended up with a little too much liquid. So, I would recommend partially draining the tomatoes to cut back on the liquid. You can always add more if you need! I love cooking with my oils from Oli.O! This cilantro & roasted onion is perfect for adding a little bit of that Mexican flavor! 7. Sprinkle the shredded cheese on top and continue to cook until the cheese is melted. Top with fresh cilantro and it's done!! Of course, my sous-chefs are always ready! I love that you can eat this dish in so many ways! In a bowl by itself, over greens or chips, or even in taco shells! It makes great leftovers, so you could try out different ways to serve the dish!